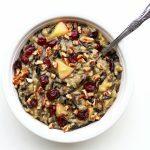 A combination of wild rice and brown rice are pressure cooked with onion and seasonings and then tossed with honeycrisp apples, toasted pecans and craisins. A festive and delicious side dish! Turn your Instant Pot to the saute setting. When the display says HOT add in the butter and swirl it around until it is melted. Add in the diced onion and saute for about 4-5 minutes. Add in the garlic and saute for 30 seconds. Turn off the saute setting. Add in the chicken broth, dijon mustard, salt, parsley, pepper, oregano, thyme, bay leaf and rices. Stir. Cover and pot and secure the lid. Make sure valve is set to sealing. Set the manual/pressure cook button to 25 minutes on high pressure. When the time is up let the pressure release naturally for 10 minutes and then move the valve to venting. Remove the lid and stir in the apple, craisins, pecans and vinegar. Serve topped with a sprinkling of goat cheese, if desired. This recipe can easily be doubled. Double the ingredients and keep the cooking time the same. I made this as a side dish but you could make it into a meal. Add some bone-in chicken to the top of the dish and cook it right alongside the rice. Wild rice takes a little longer to cook so I would opt for the bone-in chicken as opposed to boneless skinless chicken breasts. They would get overdone.